When I think of tote bags I think of my high school history substitute teacher, who wore knee hi’s and skirts that weren’t long enough to cover when her hose started to roll down. She would walk into the classroom with her tote full of books and snacks to get her through her subbing day. Thankfully, those images of teachers, librarians, grannies are long gone because totes are so chic right now and not to mention, environmentally friendly. Whew, what a relief that they are in because I am one of those people who uses tote bags for everything. If I am going to drop my son off with the sitter everything goes in a tote bag. If I am taking food to a meeting, yup it goes in a tote bag. When I walk to the market, my fresh veggies and fruits go in the tote bag. Does your tote bag need a make-over? You can’t bring yourself to get rid of it because it’s so darn reliable and not to mention practical: it holds your lunch, water bottle, stinky gym shoes, library books and groceries. 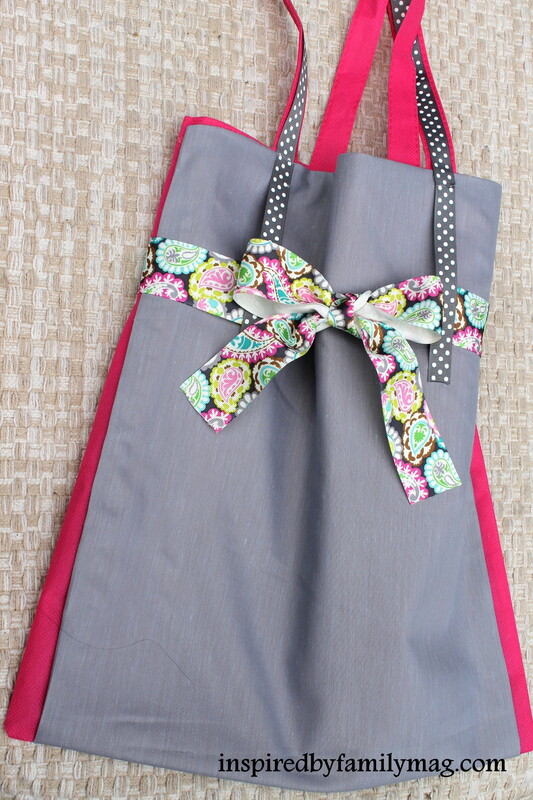 I am going to show you how your tote bag can go from drab to fab in 20 minutes and you won’t have to toss it out. Whether you’re a male or female, a student, a stay at home mom, a working mom or granny, after your tote make over you will want to “work” that tote bag like it’s the latest Burberry! 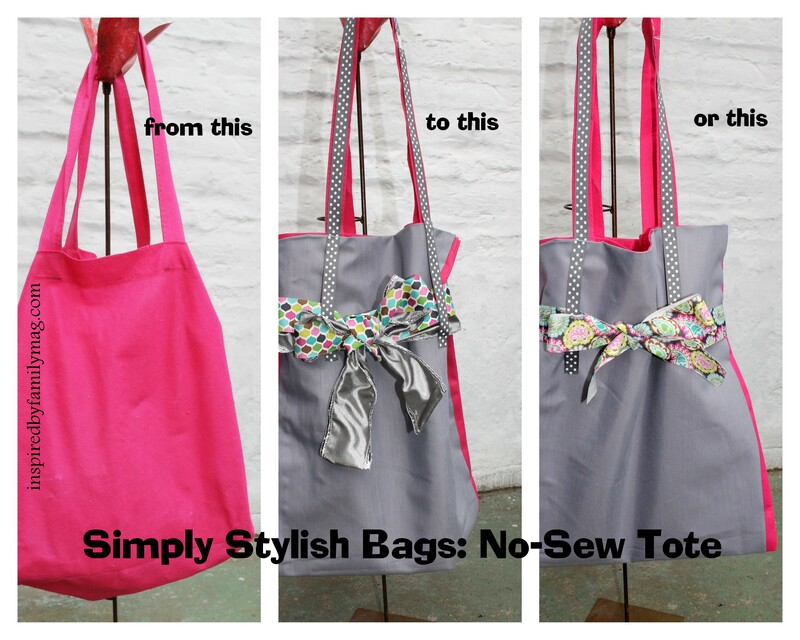 Here’s how your tote bag can be stylish and practical without any sewing involved. 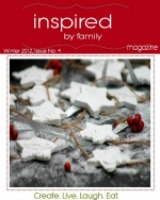 *If you are new to Inspired by Family, let’s be friends and join us via Facebook or Feedburner. 1. 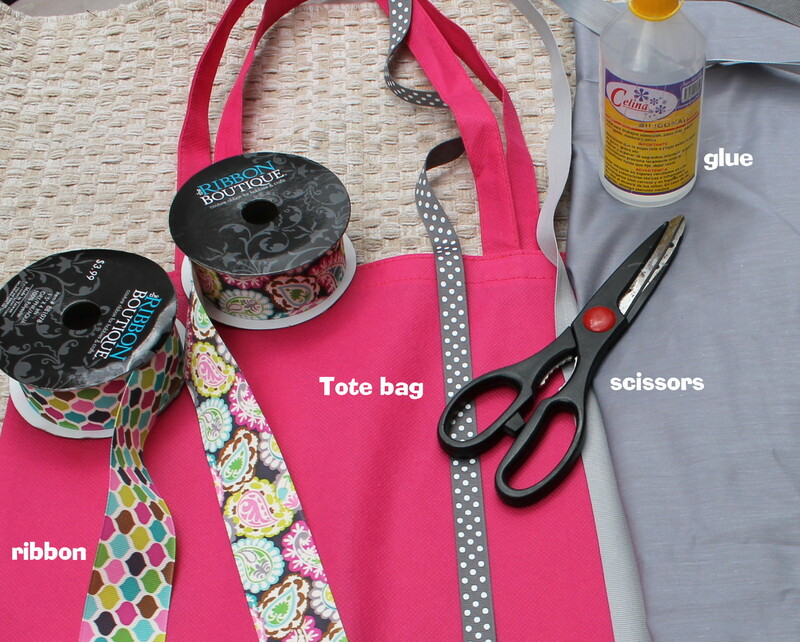 Place your choice of fabric flat on the table and trace the tote around it and cut. 2. 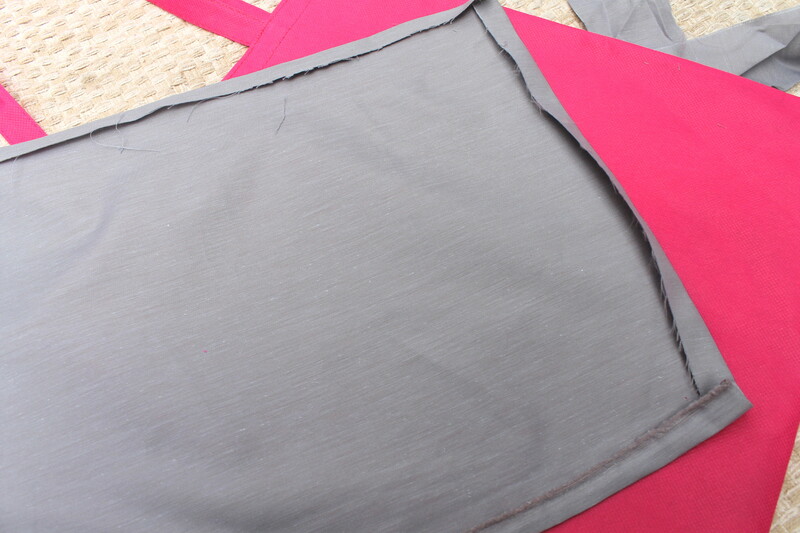 Fold over about 1/2 an inch of the fabric and iron it down so it will stay while you glue. 3. Then apply glue to each corner to keep the flaps down. Place the fabric in the middle of the tote. 4. Use your good craft glue. I use silicone glue and apply it over each side and press it down on the tote in the center. 5. Now for the ribbon. First apply glue on one end of the ribbon. Then apply glue on the ribbon where the bag ends. 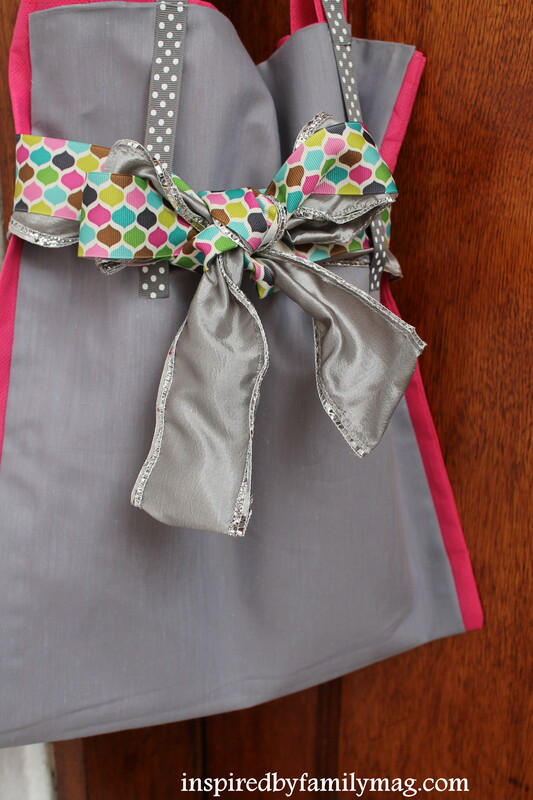 You will leave the middle opened so you can slide your ribbon or fabric through to make your bow. Then apply glue on ribbon to go around the straps. If you would like to add a couple of stitches on each end of the ribbon where you will slide your fabric for the bow, feel free to. The great thing about this bag is you can have a different look by just changing up the ribbon. I saw your bags somewhere (Pinterest?) and thought that they were cute, but never looked far enough to see that you were the creator, Mari. These are so cute! Ooh isn’t fabric glue simplye amazing?!! 🙂 Fantastic little bag! What a cute and easy idea! Thanks for sharing! Such a cute transformation! I love it. 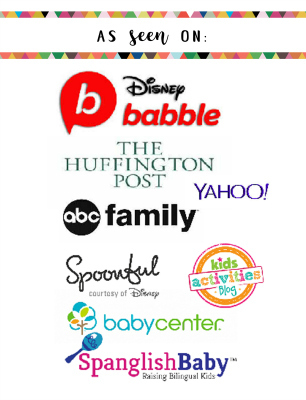 If you get a chance come share your tutorial at my Pin Party. Such fab results so easily – gonna have to get some glue! So cute! The ribbons you chose are such fun. Very pretty. I love the colours. Looks very pretty,thanks for sharing. 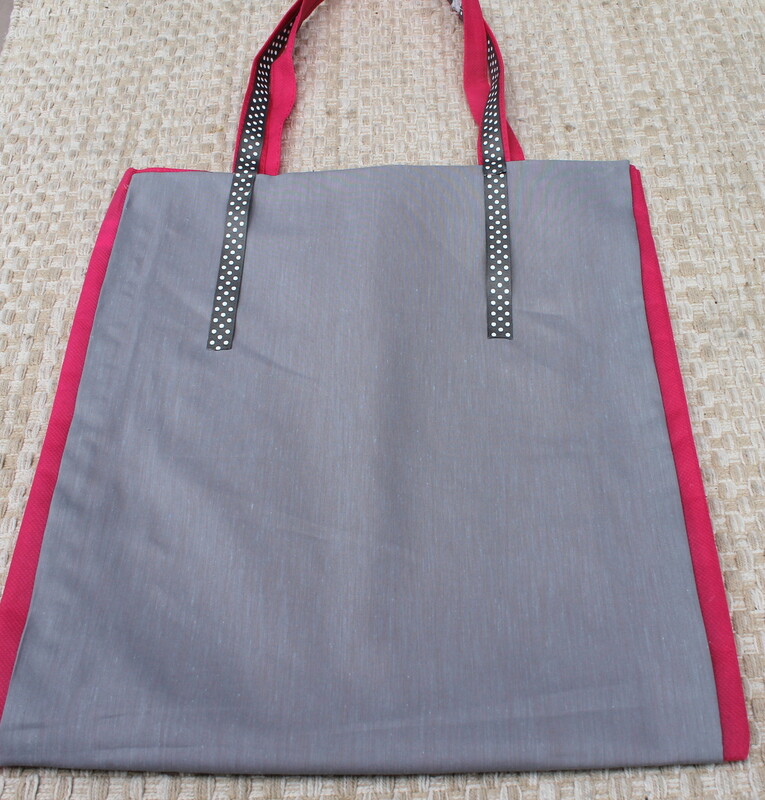 Lakshmi, The tote bag is an already made tote bag and the gray fabric I used was just cotton.